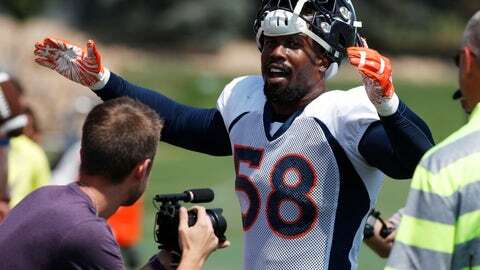 ENGLEWOOD, Colo. (AP) — Von Miller said he’s unaffected by the new NFL rule prohibiting defenders from landing on top of quarterbacks, requiring them instead to shift his weight to the side to avoid a flag. “None of the rule changes affect my game. I don’t really tackle quarterbacks with all my weight anyway. With all 185 pounds? No, I wouldn’t treat a quarterback like that,” said Miller, who’s actually 250. Miller said he has no issue with the league’s new helmet rule that’s causing so much consternation at training camps this summer as teams wonder what all will constitute a foul. Broncos coach Vance Joseph said the new rules designed to protect players will affect the offense more than the defense because defenders have been taught for years to see what they’re hitting whereas, say, running backs naturally duck their heads and linemen bang helmets all the time. Defenders, though, will get flagged for crushing quarterbacks if they don’t break their fall by turning to the side to avoid landing on top of the passer. An example of the hit that’s now prohibited is the one Vikings linebacker Anthony Barr put on Packers quarterback Aaron Rodgers in Week 6 last year that broke Rodgers’ collarbone. Line judge Julian Mapp was among the officials who visited the Broncos this weekend to discuss the rule changes. Asked how difficult it would be to determine whether a pass rusher has put more than half his body weight on a quarterback, Mapp said, “I’m a line judge but talking to some of our referees, what we’re looking at is that — I’m not a University of Florida fan or anything — but we’re looking for what we call a ‘Gator Roll.’ We want you to take your weight off of the quarterback. Miller said the changes won’t affect him at all. “I’ve been good when it comes to all of those rules,” Miller said. “I respect the game. I know we need to keep our quarterbacks healthy. Those guys make football what it is, so we’ve got to take care of those guys.